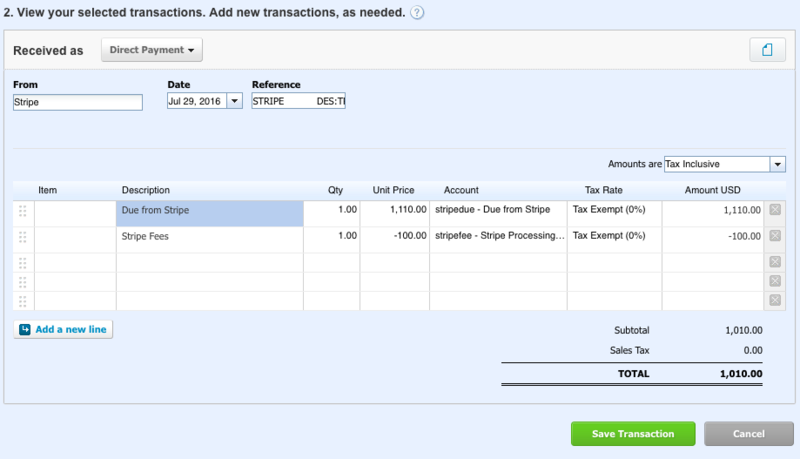 Setting up tender/payments types for Xero Banking – SHOGO Knowledge Base. As discussed in the Xero posting methods section, Shogo supports three posting methods. The following article discusses the banking implications in Xero for each posting method. Where appropriate, we have provided links to relevant help articles on Xero's support site as well. Xero Journal Entry: When using the journal entry posting method, most customers will use one or more "clearing accounts" in order to accept the deposits as reported on their Xero bank feed. As Xero does not allow direct integration with account types in Xero that are "Banks," each of the above above would be defined in Xero as Current Asset account types. Using this approach, you will not attempt to match individual transaction as they clear your bank account. Rather, you would monitor the balance in the clearing account(s) to ensure that the balance is clearing itself over time. 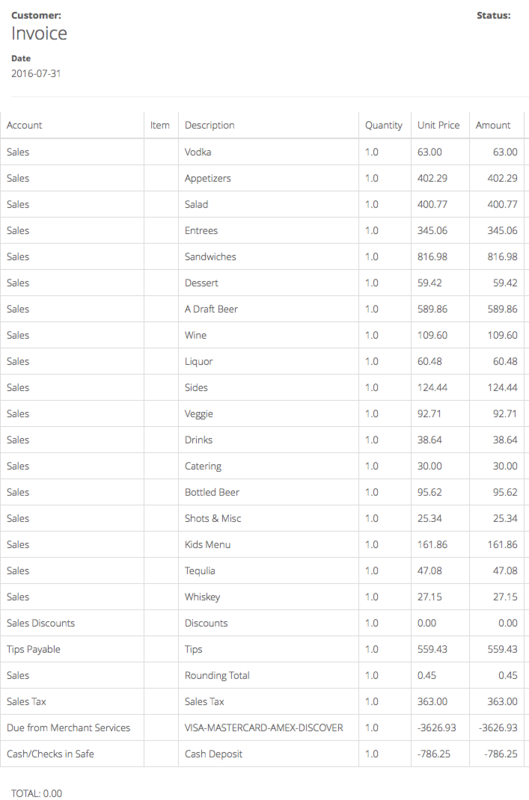 As your sales are processed from your POS, the balances in the respective clearing accounts will increase. Then, as you add/accept the actual deposits that Xero reports on your bank feed, you would accept the deposit against the appropriate clearing account. You can also establish Bank Rules in Xero to automate the assignment of the correct clearing account and contact information. Cash on Hand: the balance in this account will be the amount of cash you have collected from sales at your store which has yet to be deposited at your bank (or has been deposited but not yet credited to your available funds balance). When saved, the above transaction will post an accounting credit to the due from account, an accounting debit to the fee account, and an accounting debit to the bank account for the net amount of the actual deposit. 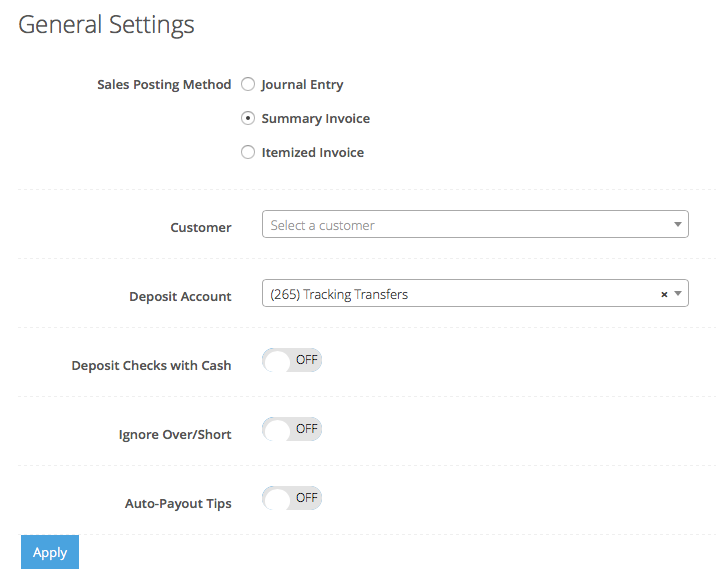 Xero Invoice: When using the Summary Invoice posting method, customers have the option of using clearing accounts just as in the Journal Entry. Using this option, the Shogo accounting process will create a net zero invoice with the payments received posting as individual lines on the invoice but as negative amounts e.g. the sales on the invoice will be offset by the payments received for those sales - resulting in a net 0 invoice. The banking processing would be identical to the journal entry method. If a customer wishes to try to match (reconcile) each tender deposit as they are processed on the Xero bank feed, they can use the "Separate Deposit" feature contained in the payments portion of their mapping mapping configuration. 1). A sales invoice that is fully paid and netted against the clearing account designated by the user in their general settings for accounting. 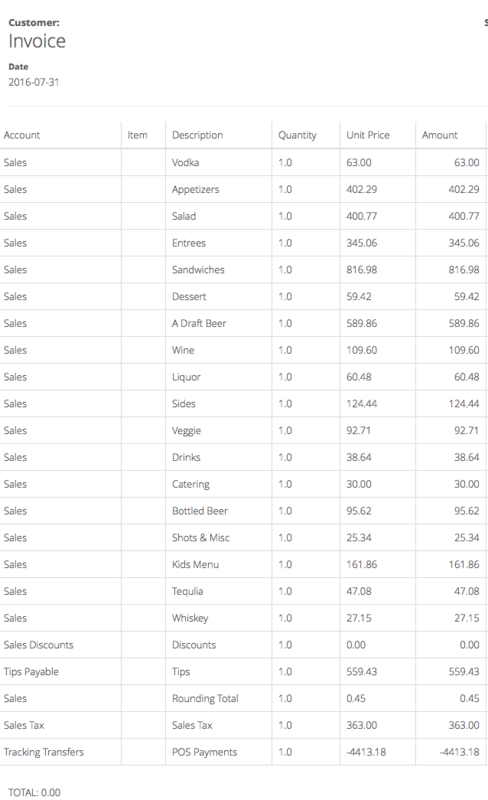 Note that the invoice below nets the total sales (plus taxes, less discounts, etc.) against the designated clearing account. Additional invoices are also created for each tender type designated as a "Separate Deposit." In this case, all credit cards will create one invoice and cash will create another. These invoices are "plugged" against the same clearing account as the sales invoice so that the clearing account will net to 0 for a given sales date. The above invoices will create an outstanding entry to the customer's Accounts Receivable account and will also make the above tenders (payments) invoices available for matching in the Xero Banking module, rather than adding/creating them as in the clearing account approach.